Asthma remains the most common chronic childhood health condition. In addition to harmful physical aspects of the condition, asthma incidents negatively impact school attendance and cause significant stress for caregivers. Exposure to allergens and irritants found in the indoor environment are major factors in the development and increasing sensitivity to asthma. 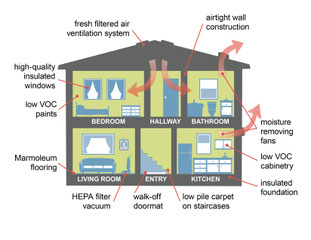 To provide a home environment specially designed and built to reduce asthma triggers, Seattle Housing Authority created the Breathe Easy Homes program, which has had remarkable results. Specific mechanical and physical features make Breathe Easy Homes different from standard units. The most important is a ventilation system that pumps fresh, filtered outside air into the unit. Additional technology ensures efficient heating and cooling, and specially selected interior finishes and furnishings reduce the harmful emission of gases and chemicals. Education is another significant component of the Breathe Easy Homes program. Residents learn how to maintain healthy indoor air through certain behaviors and choices they make about what they bring into and use in the home, including appropriate cleaning products. As part of the High Point redevelopment, SHA built 60 Breathe Easy Homes between 2003 and 2007. The homes are scattered throughout the community, located on several blocks and situated in small clusters that also allow for the extension of appropriate design considerations to outside plantings and landscaping. The first occupants of the new Breathe Easy Homes were selected from a pool of original High Point residents with children who suffered from asthma. 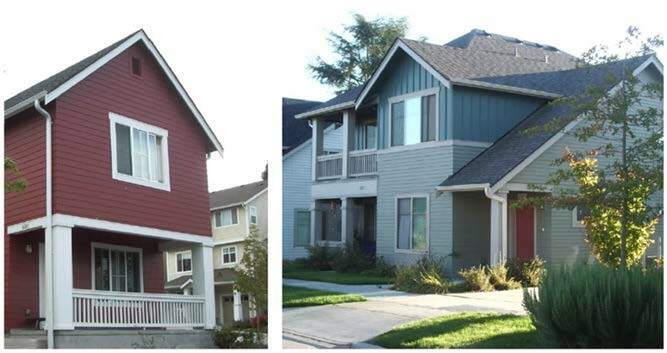 To study the program’s effectiveness, scientists from the University of Washington and Public Health - Seattle & King County studied and compared health conditions at old public housing units and newly built Breathe Easy Homes. The study demonstrated a strong link between the new built environments and healthy outcomes. It compared results for low-income children and adolescents with asthma living in a standard unit and living in a Breathe Easy Home. Both groups had received in-home asthma education. The study results were impressive. Children and adolescents with asthma who moved into a Breathe Easy Home experienced large decreases in asthma illness and trigger exposure. Researchers reported that for the Breathe Easy Home residents their days without asthma symptoms increased from a mean of 8.6 days per two weeks in their old home to 12.4 days, after just one year in the Breathe Easy Home. 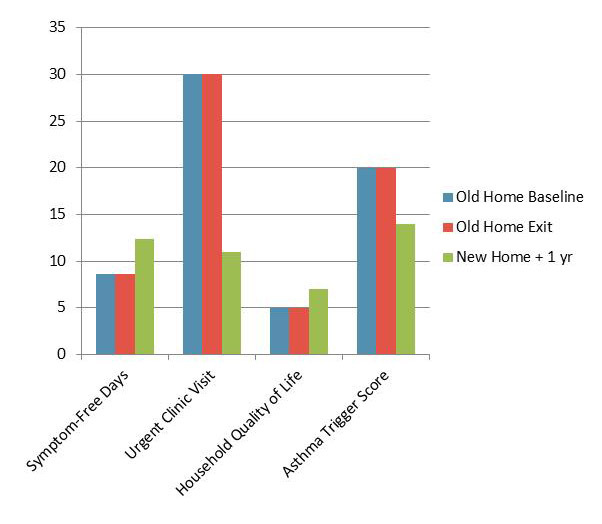 The proportion of Breathe Easy Home residents with an urgent asthma-related clinical visit in a three-month period decreased from 62 percent to 21 percent. The quality of life for others in the Breathe Easy Homes also improved significantly, more than for those in the comparison group. Exposures to mold, rodents and moisture were nearly eliminated. Redevelopment of another SHA community, Yesler Terrace, provided a new opportunity to improve residents’ lives by ensuring healthy indoor air quality. All SHA-built Yesler units are equipped with a whole house ventilation fan. This system provides fresh outside air while recovering about half the heat content of the exhaust air. An added benefit is that the air is filtered, eliminating 99 percent of pollutants. Some units at the Hoa Mai Gardens building take air filtration to an even higher level by using HEPA filtration that removes 99.99 percent of pollutants. By also eliminating carpet in the units, the quality of indoor air is significantly improved, as compared to standard newly built code-compliant units elsewhere. 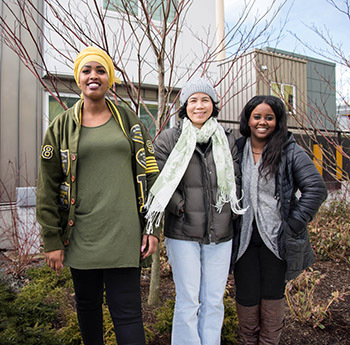 On the resident education front, SHA has partnered with Neighborcare Health to employ three Yesler residents as Community Health Workers. As part of their broader health related outreach, these trained and certified CHWs receive training on Breathe Easy from the American Lung Association and on household practices and products from King County’s Clean Green Hazardous Waste. CHWs then help residents with the behavioral aspects necessary for healthy indoor air, including assessment, education, training and the selection of cleaning materials. They educate residents on using fewer toxic products, installing dust mite covers, ventilating homes more frequently, using fans, taking shoes off at the door, vacuuming more frequently and taking other measures known to be effective. CHWs provide new Green Clean Toolkits to residents and give presentations at new building openings, community events and annual health fairs. CHWs track how often household members have complained about symptoms of asthma, allergies or other chemical sensitivities.